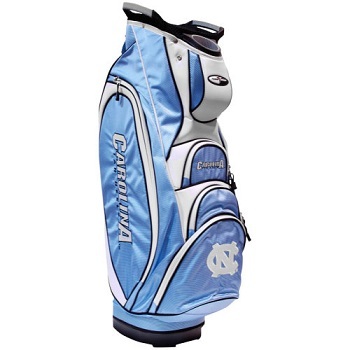 "Buy your University of North Carolina Golf Bag from the College Golf Bag Experts"
This is Team Golf's Victory model University of North Carolina Cart Golf Bag. It features two integrated top handles, a 10-way top divider system separating into 3 bottom compartments, an oversized external putter well, 5 zippered pockets including a new-this-year insulated cooler pocket on the largest side pocket and a fleece-lined pocket for valuables, padded strap with strap pouch, removable rain hood, umbrella holder, towel ring and velcro glove holder. Weight: 8 lbs. Fully licensed. 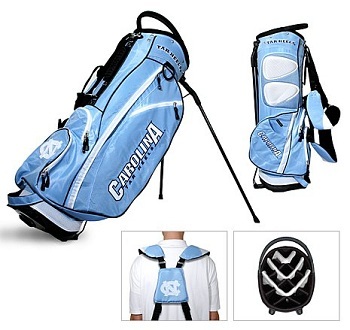 This lightweight but durable University of North Carolina Stand Golf Bag features an integrated top handle and 2 lift-assist handles, 14 full-length dividers, embroidered North Carolina logos in 6 locations, 5 zippered pockets including cooler pocket, fleece-lined valuables pocket, removable rain/travel hood, umbrella holder and towel ring. Fully licensed and manufactured by Team Golf.